Ai Weiwei’s cutting edge art, blogging, and sacrifice on behalf of freedom in China. 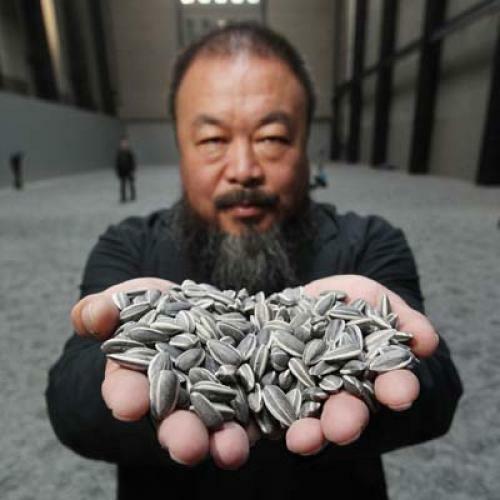 The Chinese artist Ai Weiwei is a very brave man. Long before April 3, when he was taken into police custody by the Chinese authorities in Beijing as he attempted to board a flight for Hong Kong, he knew that his vigorous support for human rights in China put him on a collision course with the government. He was badly beaten by the police in 2009, his blog was shut down that same year, and in 2010 his new studio in Shanghai was bulldozed by authorities. True, Ai may have imagined that his immense prestige in the international art world—he is regarded as the Chinese answer to Joseph Beuys, a post-Duchampian shaman with an Asian spin—would have provided him some protection. And for a time it did. But Ai, who as a child during the Cultural Revolution saw his own father, Ai Qing, a famous poet, sent to western Xinjiang province, China’s “little Siberia,” where he was given the lowliest of jobs scrubbing toilets, cannot have been unaware of the risks he was running as he protested the policies of China’s totalitarian regime. The new China, much like Stalin’s Russia, only plays the cultural diplomacy card so long as it works to its own advantage. Even the country’s most celebrated artistic spirit—Ai collaborated with the architects Herzog & de Meuron on the design of the Bird’s Nest Stadium at the 2008 Beijing Olympics—can be sent to prison, just like any other citizen of the police state. Ai is a fire and ice personality. The ice is in the impossibly self-confident impresario who has become a hero of the global art world with his sometimes elegant, sometimes arrogant, sometimes frankly obnoxious appropriations and deconstructions of China’s cultural heritage. His best known works include: Dropping a Han Dynasty Urn (1995), a set of three photographs showing Ai as he shatters the ancient artifact; Template (2007), a construction made of 1001 wooden doors and windows from demolished Ming and Qing Dynasty homes; and Circle of Animals/Zodiac Heads, currently on display in New York in front of the Plaza Hotel, which consists of bronze replicas or reconstructions of heads designed by European Jesuits for the Manchu emperor Qianlong. The fire—which you find on nearly every page of a new book of Ai’s writings, Ai Weiwei’s Blog: Writings, Interviews, and Digital Rants, 2006-2009 (The MIT Press)—is in his critique of contemporary China and the political stands he has taken in the past half-dozen years, including his outspoken support for parents whose children were killed when shoddily constructed schools collapsed during the Wenchuan earthquake in 2008. If the work that has earned Ai an international following reflects the taste for chilly ironies that dominated the New York art world during his time in the city between 1981 and 1995, his experiences in China have turned this swaggering art world insider into an enraged social outsider. Confronted with the fury of the Chinese government, which is cracking down on dissent in the wake of the Arab Spring, the international arts community has been left to grapple with the terrifying fact that Ai, an artist who is “one of ours”—a global art brand, a star of the international exhibition circuit who has at times taken the role of fashionable trickster—can quite simply disappear. But the man who emerges in Ai Weiwei’s Blog is not exactly “one of ours,” as he is certainly like no other figure in the global art world. As an artist, his frame of reference may be the end-game avant-gardism of Duchamp, Beuys, and Nauman, but by now Ai’s experience suggests a very different trajectory. Invited in 2007 to create a work for Documenta, the granddaddy of all cutting edge international art events, Ai came up with Fairytale, which brought 1001 Chinese citizens from all parts of the country and all walks of life to Germany. In some sense this was just another clever spectacle, performance art on an epic scale, except that, in the end, Ai’s farmers, laid-off workers, and street vendors had to go back to China and survive in a world where, by Ai’s own testimony, the modernity that is taken for granted at Documenta has not yet been born. In the current issue of The Art Newspaper—a must read among dealers, curators, and collectors—Ai is quoted, a few days before his detention, mocking the globalist claims of the Chinese government when it comes to art and culture. “They are not trying to support [art], they are pretending, you know, you have a Prada, we have a Prada; you have Armani, we have Armani; you have a MoMA, we will have a MoMA.” What Ai is saying is that until people are free—until each person is released from the tyranny of “The People”—you cannot have a Museum of Modern Art. We should listen to this man. He speaks from experience.